This project status is still Critical (I.E. Red). The resources needed are working on the KUMC/Hospital Exchange project. For META, the team is scheduled to restart regular meetings on November 30th (rescheduled from November 16th). Analysis continues on multiple years of software purchase data, with a focus on overlaps between KU-L and KU-M, looking at total spend with each individual vendor. On October 31, 2012, KU signed a new three year contract with Microsoft for a Campus Agreement. This agreement included ECAL licensing for both KU Lawrence and KU Medical Center, offering software and functionality beyond the prior agreement. Savings on the Microsoft Campus Agreement for the KU Lawrence campus is $90,199.54. The savings for the Echo360 license were re-analyzed in detail and we determined that we recognized a cost avoidance of $99,975 by renewing one month early. An annual actual cost savings will be recognized by the Edwards Campus ($27,000), School of Pharmacy ($27,000), Wichita Campus ($25,000) and School of Engineering ($28,000), for a total of $107,000 in actual cost savings for each area that will not have to be spent on their departmental license for Echo360 going forward. Total Leveraging Software Purchasing savings recognized to-date is $297,174.54. The workgroup continues to monitor new processes and collect cost savings data. We are working on some promotional ideas to increase MFD awareness and utilization. The server centralization team has met with and reviewed registration data for three additional groups on campus and began the development of plans for their future hosting needs. This bi-weekly period achieved a lower number than typical review meeting due to the Thanksgiving holiday. TSC Manager for Administration TSC opened for KU Internal staff only to promote career advancement opportunity for IT Staff, close day is Dec 2, 2012. Project Team did not meet due to holidays, meeting resume on Nov 26th. Social Welfare IT assessment completed. 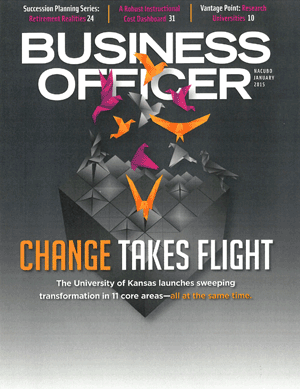 KU IT Senior Staff will discuss internally on how to proceed with Centralization. The CLAS subproject is moving to production in the next two weeks and the Invoice Processing subproject is continuing in the design phase. The Executive Sponsors met and agreed to engage Huron to assist KU in setting the direction and defining the goals of this project. The Graduate Studies CRM project meetings are being held weekly with IT and CollegeNET staff. CollegeNET has released some functionality of the new system for testing. The goal is to have most functionality available and in production by January 2013. The Business & Industry CRM weekly project meetings were suspended temporarily while we interviewed each stakeholder regarding the information they need, the data they have currently and are able to share. The current focus of this project is developing all of the data requirements needed for this system. Additionally, discussions are being held with potential vendors to develop a system. All early adopter website administrators have been trained and given account access to migrate their departmental websites to the CMS. Most have completed their migrations. The remaining sites will complete their migrations over the spring and summer months. All IT work has been completed for this phase of the project. The fall pilot of Early Warning began on 08/20/2012. We have five confirmed courses for the pilot for spring 2013. An email has been sent to faculty members teaching spring 2013 classes with 200 or more students, inviting them to consider using MySuccess in the spring. The fall pilot began on 08/20/2012. Students in the pilot are able to schedule appointments online with pilot course advisors. Work is under way to develop a system that will enable the various schools and departments to load advisor assignment information into the system for all undergraduate students.